One of the most significant artists in Indian Modernism and a founder member of the Bombay Progressives, S.H. 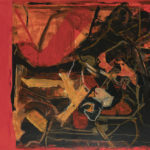 Raza’s diverse body of work is a unique amalgamation of his classical French training at École des Beaux-Arts, Paris, and his exposure to post-war American abstract expressionism. Raza’s works are imbued with the Indian visual language of his heritage, celebrating the country’s iconography, nature, philosophy, music and poetry. 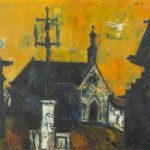 Curated by Vaishnavi Ramanathan​, curator and art historian, Piramal Museum of Art, and Ashvin E. Rajagopalan​, Director, Piramal Museum of Art, the exhibition will showcase five decades of Raza’s work from the early 1940s to the late 1990s— his early days in Mumbai, his travels around India, to various parts of France including Gorbio, and eventually his metaphorical return to his Indian roots. The exhibition traces his development as an artist and philosopher, whilst offering insights into his contributions to post-Independence Indian abstraction. The artworks on display highlight Raza’s significant influence on his peers, including the Bombay Progressives Group, and subsequent generations of Indian artists by taking a sweeping view of his rich artistic journey across continents, styles and philosophical musings. S.H. Raza: Traversing Terrains has been conceptualised and designed to highlight Piramal Museum of Art’s meticulously unique approach to art display, and furthers its vision of creating well-rounded exhibitions that appeal to the public on multiple levels. Re-defining the framework of art display in India, Piramal Museum of Art are working with critically acclaimed exhibition designers Gallagher & Associates, who have custom designed the exhibition space to showcase the artist’s work in an immersive and engaging context. Interactive displays, special programming and custom-designed lighting will offer diverse audiences unique opportunities to engage with the works. This one-of-a-kind exhibition is a compelling homage to Raza’s legacy allowing audiences to navigate an exhibition space that physically and aesthetically mimics the distinct visual language of the artworks. When viewed from above, the entire gallery space and installed exhibition appears as an innovative Raza painting. Featuring key works from the Piramal Art Collection, S.H. Raza: Traversing Terrains opens to the public from 24 June to 28 October 2018. Piramal Museum of Art has also curated a special series of programmes to complement the show, including outreach events for younger audiences, schools, and the public over the course of three months. Ashvin E Rajagopalan is an art historian and Director of Piramal Art Foundation. For the past 10 years he has been curating the Piramal Art Collection which includes seminal works of Modern & Contemporary Indian Art. In 2015, Ashvin set up the Piramal Museum of Art at Lower Parel, Mumbai that focuses on collaborative exhibitions between institutions and collections and has a very inclusive vision for its audiences. Vaishnavi Ramanathan is a curator and art historian. She has curated several shows on contemporary Indian artists and has written for important art magazines. She is also a guest lecturer at the Government College of Fine Arts, Chennai. Sayed Haider Raza (S. H. Raza), born 1922 is one of India’s most renowned modern painters who accomplished incredible success around the globe during his career. Educated at the Nagpur School of Art, and thereafter studied at the esteemed J.J. School of Art in Bombay (1943-1947), Raza was a founding member of The Bombay Progressive Artists’ Group (Est. 1947), alongside F.N. Souza, K.H. Ara, H.A. Gade, M.F. Husain, and S.K. Baker. The group rebelled against the revivalist nationalism of the Bengal School of Art and ignited a new Indian avant-garde movement engaging closely with contemporary currents in international art, motivated by a desire to create a new language of Indian aesthetics. 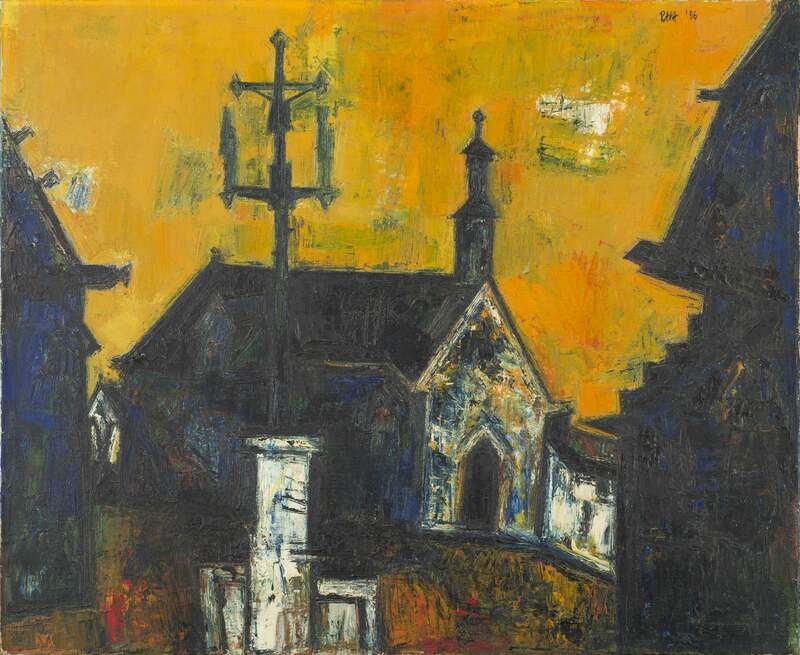 Raza was awarded a scholarship to study at the École Nationale Supérieure des Beaux-Arts, ​in 1960, and is one of the notable Indian artists who worked in the West for a significant part of his life. He explored and experimented with different tides of Western Modernism, and emerging trend of American Abstraction, shifting gradually from figurative painting style to more abstract forms. 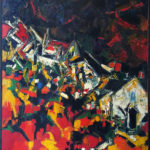 Raza’s canvases in the 1950s and 1960s incorporate picturesque, bucolic French villages, the epitome of Expressionist landscapes. 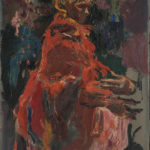 In 1956, Raza became the first non-French artist to be awarded the prestigious Prix de la critique and six years later, in 1962, he became a visiting lecturer at the University of California in Berkeley. By this point in his career, Raza was moving steadily towards greater abstraction. Raza received the Padma Bhushan from the Indian government in 2007 and the Padma Vibhushan in 2013. He was conferred Commandeur de la Legion d’Honneur (the Legion of Honour) from the government of France in just before his death in 2015. Established in November 2015, Piramal Museum of Art is a state-of-the-art museum with its primary space in Lower Parel, Peninsula Corporate Park, and two galleries in Byculla and Kurla, along with Piramal Art Residency at Piramal Vaikunth in Thane. The 7000 sq. ft. space is a disabled-friendly, public access Museum, pioneering a dynamic exhibitions programme that activates its rare collection of Indian contemporary and modern art. To date, Piramal Museum of Art has presented curated exhibitions featuring the art works of masters such as Abanindranath Tagore, Gaitonde, K.Ramanujam, K.G. Subramanyan and Raja Ravi Varma, amongst others, critically acclaimed for their research, and their intensive yet lucid approach to exhibition making and design. The Museum incorporates specially tailored education and community programmes that offer audiences insights and information into the curatorial perspectives with the goal of providing an inclusive and engaging environment to foster arts appreciation in the public.